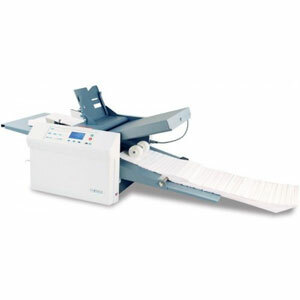 Formax FD 382 Folder is a high speed, versatile and reliable folder for getting timely and efficient production for your business, school, department etc. Formax 382 Folder has automatic fold plates that provide easy set-up of 18 pre-programmed fold settings. The Tabletop FD 382 Folder has a streamlined user interface, which ensures fast accessibility and accountability by the user. The hopper capacity of Formax 382 Document Folder is 500 sheets and is capable of folding all of them in as fast as 2 minutes. It features an optional multi-feeder that ensures continuous and uninterrupted work production. The FD-382 Document Folder has user-friendly system for controlling and a 2.8-inch backlit LCD display, which confirms fast and easy operations for the user. The Formax FD382 Automatic Document Folder has advanced software and adjustable settings that allow users with different needs to get their work done easily and accordingly.